Putting new into the old – a Phonograph upgrade. [smellsofbikes] recently came into possession of a 1970’s “stereo radio phonograph” cabinet consisting of a vinyl record player, AM and FM radio, and eight track tape player. The radio worked, the turntable didn’t sound too nice, and the tape player didn’t work at all. A new needle fixed the turntable, but the eight-track was in bad shape. So he replaced the tape player with a BeagleBoneBlack which plays streaming internet radio. Hopefully, this fix is temporary, since he has carefully disconnected the tape player connections in the hope of fixing it soon. The swap out involved a fair bit of engineering, so he’s split his build log into several bite sized chunks. The first step was to set up the BBB, upgrade it and add in all the network and audio related stuff. Audio on the BBB is available only via the HDMI port, but [smellsofbikes] had a USB soundcard handy, so the next step was setting that up. He installed mpg321 – the command line mp3 player and set it up to play music streaming from somafm. Next up was getting some scripts and programs to run automatically during system bootup. The final part of the setup was adding a WiFi router as a repeater connected to the BBB via an ethernet cable. He could have used a tiny WiFi USB dongle, but he already had the router lying around, and he wanted to dedicate USB to audio functions alone, and use the Ethernet port for Internet. He then worked on identifying the wires that go from the tape player to the amplifier, spliced them, and hooked them up to the audio sound card on the BBB. With this done, the upgrade was more or less complete – the system played streaming music and stations could be switched remotely (via SSH to BBB). [smellsofbikes] reckoned it would be nice to use the existing controls in the phonograph cabinet to control the internet streaming music, instead of controlling it via a remote computer. The cabinet had 4 indicator lamps that indicated which track was being played and a button to switch between tracks. He removed the old indicator panel and put in a fresh PCB, designed in KiCad and cut on his LPKF circuit board plotter. An aluminum knob machined out of hex bar-stock works as the new track change button. At this point, he called it a wrap. The BBB and Asus router go inside the cabinet, and the old (non-functional) tape player is put in place. Quite an interesting build, and we look forward to when he actually gets the tape player working. [Alan Martin], aka “The Most Interesting Engineer In The World” has told him that “it is a moral imperative that you repair the eight-track and get it working”. [Alan] has promised to send [smellsofbikes] a suitcase full of brand new, still in their plastic wrappers, eight-track tapes when he gets it working. So you want to play some retro games on your BeagleBone, just load up Linux and start your favorite emulator right? Not if you’re serious about it. [Andrew Henderson] started down this path with the BeagleBoard-xM (predecessor of the BeagleBone Black) and discovered that the performance with Snes9X wasn’t quite what he had in mind. He got the itch and created a full-blown distro called BeagleSNES which includes bootloader and kernel hacks for better peformance, a custom GUI, and is in the process of developing hardware for the embedded gaming rig. Check out the documentation that goes along with the project (PDF); it’s a blueprint for how open source project guides should be presented! The hardware he’s currently working on is a Cape (what add-on boards for the BBB are called) that adds connectors for original Nintendo and Super Nintendo controllers. It also includes an RTC which will stand in for the real-time clock features included in some cartridges (Pokemon Yellow). Also in the works is a 3D printed enclosure which would turn it into a portable, something like this other BBB portable hack. Check out a demo of what BeagleSNES can do in the video after the break. This is just a friendly reminder that our Santa-Pede challenge will be ending soon. Please send your submissions to us by emailing them to bbb@hackaday.com or by posting them in the projects section of our forum (did we mention we have a forum now?) by the end of January to be considered. We don’t care how silly, stupid, simple,or slick it is, just send it to us! 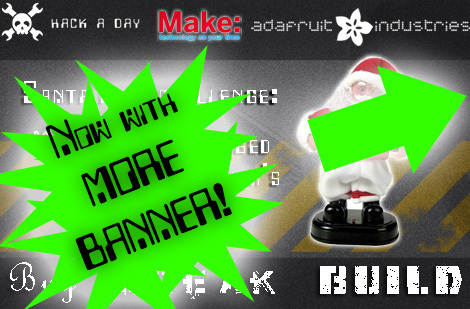 We have some fun prizes from Adafruit and Make and even have [Phillip Torrone] as a judge. Get those submissions in ASAP. We are going to give the Santa-Pede Challenge another try. This time, you have till the end of January to do something (make it walk/crawl/scoot) with a dancing santa (or dancing musical holiday toy). As you can see in my example, it doesn’t have to be complicated or efficient in any way. 1. Many of you suggested a banner of some type to remind you. Great idea, we were waiting for some other features to be added, but we’ve just gone ahead and popped them in. You can see the featured items at the top of the right hand column. 2. Some pointed out that the “Buy Break Build” title isn’t very hack-ish since we often preach up-cycling. yeah, we really think you should find these santas anywhere. The alliteration is fun though isn’t it? You can get all the rules by going to the original post. Just note that the last date for entries will be January 31.